SAP is such a vast system that it’s very easy to miss functionality in the base system. We regularly field requests for a solution to print labels for bins on demand. Here are some ways you can use existing SAP functions for this process. 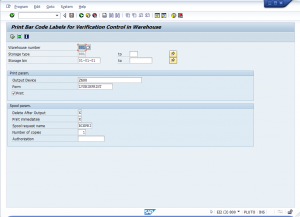 SAP has a rarely known application, “Transaction Code LM55,” that allows you to generate labels for your bins on demand. It uses a standard SAPscript format form LVSBINPRINT that SHOULD be modified to create some sort of standard for how your bins are identified. We help our customers define an identification standard when initially implementing SAP WM/EWM. At that time, we recommend that this standard is reflected in the replacement for LVSBINPRINT. Over time, your bin labels will need to be replaced and, as you add new bins, you’ll need to generate some of your standard labels. This tool ensures that all your bins are identified and follow your standards. As you perform location facing (as we recommend in our post here: Leading practices a place for everything and everything in its place) or regular maintenance, your personnel can generate labels on demand to ensure your locations are always clearly marked. Let us know if you have any questions or comments on this process. Advanced Solutions is a leading provider of SAP SCM solutions and offers the Advanced Cycle Count for SAP WM solution to help you achieve best-in-class inventory and process control. This post was originally published on AdvSolutionPros.com. Advanced Solutions is a leading provider of third party SAP support, our experts provide Application Management services , post implementation support and are considered experts in their respective practice areas of SAP.